The April FARM club newsletter is now on-line! The Grinch Christmas Award was finally presented to the Farm Club member most deserving of the title. Lloyd Hinrichs, our 2018/19 award winner has demonstrated the following quality characteristics deserving of this recognition: ba-humbug mentality to nearly everything, grizzly like facial appearance, malcontent, curmudgeon, cantankerous, hostile attitude to all things political and otherwise, just for starters. And yes, the award contains coal specifically mined from China for this award winner. The 2019 Mowing Schedule is now available! Well, Mother Nature may be playing havoc with getting our flying season started, but, our 'Motley Crew' has prepared our mowers and equipment for the onslaught of the 2019 grass growing season. Thanks to Bill, Les, Ernie, Dave, Ralph, John, Lloyd, and Charlie for the hard work. The 2019 Application and the 2019 Renewal forms are now available! The new 2019 Club Calendar is now available. Check out Ernie P.'s new F-16 electric ducted fan jet! The plane is a Flex Innovations FlexJet. Ernie says, " Other than needing a bit longer takeoff run than most of our planes, it flies very well. I made five flights, including the maiden, on Friday, 10/05/2018. And, it sounds great, with more of a roaring whoosh than a whine; much like its 1/1 counterpart. It makes a great first EDF; and I'd recommend the plane unreservedly." Bob Burnett was the happy winner of the Fall Float Fly Grand Prize raffle event. The grand prize was a 1/6 scale Balsa USA Sopwith Pup kit. Congratulations, Bob! 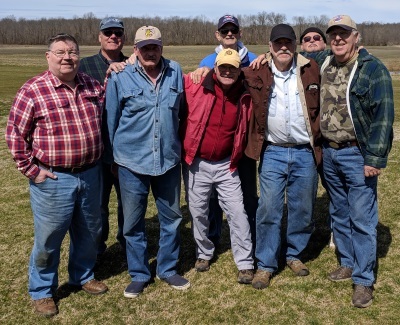 Nic Burhans has coordinated with the owner's use of the FARM field and received the FARM Club Board's approval to move the Culpeper pattern contest the ten (10) miles from the Barnstormers' Culpeper, VA field to the FARM field. The FARM field will be reserved for the CMB Pattern contest for 25 and 26 August with a setup/practice day on Friday, 24 August. After days of heavy rain, the Farm field and pit area grass had grown substantially. 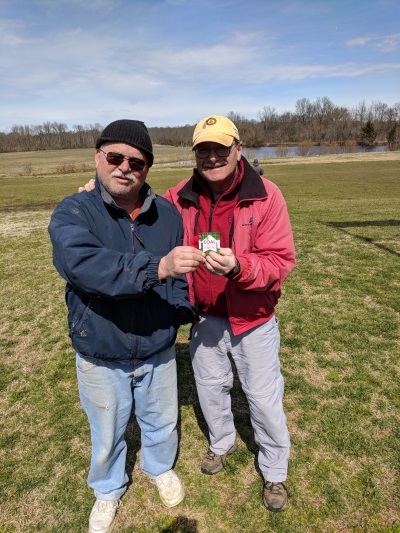 Our two heroes (Les and Ernie) spent hours mowing and re-mowing the Farm field over two days. They then raked and disposed of the clumps of cuttings in front of the shelter area. After three Learn To Fly & Picnic events had to be canceled because of Mother Nature, we finally got a break! July must be our lucky month. Here are a few pictures for your viewing pleasure (Courtesy of Dave Rothbart). The Club Picnic & Float Fly #1 @ Lake Ritchie which was held on Saturday, June 23rd, was a success despite the threat of rain. Bill, Les & Scott did the cooking for this summers event. Thanks, guys!!! Check out Ernie Padgette's Wanted item. Club Members: If you are interested in the mobile version of our website, then check out the Mobile Website link at the left for details on your options (including a FARM Club app). Be sure to check out the Area Events and Fun Fly schedules! Visitors are welcome; but, since we fly on private property, we require that all flying guests be accompanied by a club member. Anyone wishing to fly must have a current AMA card in their possession.